Bronze pasta is the queen of dried pastas - its porous surface means that it soaks up the flavour of pasta sauces. And you can easily buy it online too. I adore Italian food and if I want to cook something economical, tasty and relatively quick, then I'll usually go for a pasta dish, such as spaghetti bolognaise or pasta shells/quills with homemade pesto verde. Because of my keen interest in the subject, I often I get into conversations with people about cooking and cooking ingredients. One day, when the discussion turned to Italian food, the subject of dried pasta came up. "Of course, you should really buy bronze pasta if you're going to buy dried pasta at all", I was told. "It gives much better results than ordinary dried pasta." "Bronze pasta - what on earth is that? ", I said. "Surely the bronze doesn't mean the colour." On further enquiry, I discovered that no, the "bronze" part doesn't refer to the colour of the pasta, but to the way it's made - more on this below. Anyway, I cooked the bronze pasta up with some bolognaise sauce and it lived up to its promise - it had a pleasant, firm texture and absorbed the flavour of the sauce very efficiently. And that's the salient point about bronze pasta: it's more porous than the "normal" kind of pasta, which means that it soaks up whatever sauce you make with it. It's therefore particularly good for oven-baked pasta dishes, where you mix the sauce up with the pasta and an optional cheesy topping, before baking for - say - 20 minutes. 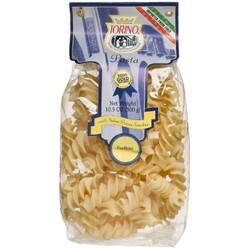 If you want to buy some bronze pasta but your local stores don't sell it, have a look at the Amazon.com capsules down the right hand side of this hub; there are plenty of varieties of bronze pasta available and they even do multi-packs. Pasta is usually made from durum wheat - the word "durum" means "hard" in Latin and this quality of hardness is what makes the pieces of pasta hold together when they're cooked! Once the wheat has been harvested, the ears are milled to remove the husk, leaving the bran, wheatgerm and endosperm. The endosperm is the "white" bit so if white pasta is the ultimate end product, then the bran and wheatgerm are removed as well. In its unground state, the endosperm can be used to make couscous or tabbuleh. When coarsely ground, it's known as semolina. It's semolina which is used as the basis for pasta. The semolina is mixed with water to give a dough. Other ingredients can be added at this stage, such as egg or spinach (spinach is what makes green pasta green). The dough is kneaded rather like bread, and once it's the right texture, it's extruded through a die, i.e. a disc with holes punched in it, before being dried and packed. (The shape of the holes determines what shape pasta you end up with.) This is where the "bronze" bit comes in. Modern commercial dried pasta is usually made with plastic dies, but bronze pasta is extruded through dies made from bronze metal. It's the slightly rough surface of the metal that imparts a porous finish to the pasta shapes, thus ensuring that they absorb whatever sauce they're cooked with. Buon appetito! Fennel is a flavorful herb. It is particularly nutritious and healthy in salads. Featured is a fennel salad with red leaf lettuce, black and green olives, and cherry tomatoes.